I became a teacher in 2002 after about 15 years working in the Mental Health/Disabled field. My reasons for leaving were a combination of hitting that proverbial glass ceiling and tired of feeling ineffective. Going into the career change, I knew the bureaucracy would be just as silly as before but one thing I always knew was that at the very least, teachers got great benefits and I knew I’d love working with kids again. During my 12 years, I’ve had to deal with No Child Left Behind, Standards Changes, Highly Qualified, even Common Core Curriculum and now any possible raises based on student performance which means I’ll never see another raise again. No sweat. It’s just a matter of outlasting the current flavor of the month until some other guy in a higher tax bracket than me gets Congress’s ear and new educational objectives are rolled. My previous career prepared me for the silliness. In 2006, I was diagnosed with End Stage Kidney disease which is a fancy way of saying, “Welcome to Dialysis.” Thanks to good insurance and an even better Treatment Center, I can do my daily treatments at home and still be able to teach. Many people, even my own health care folks, have urged me to consider going on disability but I refuse. Why? Because even though I am what those around refer to me as being “sick,” I don’t feel sick. I usually feel like this unless it's EOCT testing week. I am a young teacher at 45, have a family, and even work a second job because I am teacher after all. I was raised that you go on Disability when you cannot work anymore. I have many, many good years left in me. I want to work. I need to work as an example to my kids and my students. I am able to do both jobs, take my boy to karate, my daughter to her art club and fight car line pickups because not only do I take care of myself but so far, my benefits have allowed to me maintain a high quality of life which I deserve. 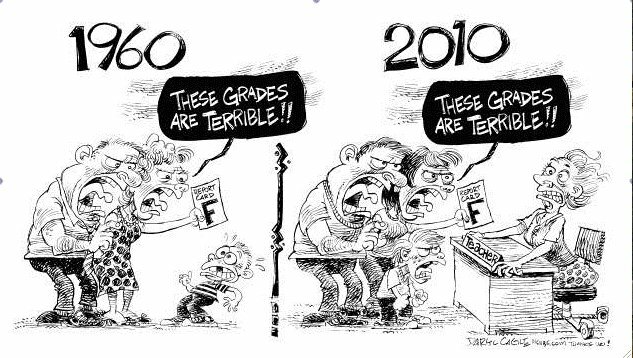 Twelve years ago I started teaching and have seen a general decline in how we are treated professionally. I love to see how valued teachers are during election year but our budgets are cut to the point of insult afterwards. I got my first raise in seven years this past August and I wasn’t happy because every teacher knows that any raise simply means their insurance rates will just increase a few months later. And mine did….again to the point I have lost any $$$ gained. Being a teacher used to have special ring to it. Sure we were underpaid but we were also respected. Parents had out backs; administrators helped us to shape the next wave of our country’s future. We had money for supplies and text books. Now it’s about furloughs, being careful who goes to ISS to keep our numbers down, keeping parents from going down to a school board. Oh, and testing. Don’t forget teaching to a test. I don’t bring up these things to be the stereotypical teacher who complains then does nothing. I bring up these points to illustrate that in spite of these bumps in the road. I still get up each morning at 6am to go into work as does all of my colleagues who, in my eyes, even better at this than I’ll ever be which is why I keep going. I don’t want to let them down. At the very least I owe them that. Nobody else seems to have our backs anymore. We don’t have to put up with this. One of the best lessons I ever taught was to a Social Skills class at an Alternative School in rural GA. The idea of it was you allow yourself to be treated as well or as poorly as you allow it. I am tired of not being respected as an educator and I am ready to do something about it. According to our politicians during their election years, we are professionals afterall. Does anybody remember Roy Barnes when he was Governor? Pretty much the only thing Ol’ Roy is remembered for is ticking off the teachers and that was the end of him. I am not saying to we must oust Gov. Deal or anything like that. This is not being political so much as advocating for ourselves. We need to rally and have our voices heard. We can be heard and we can make a change. Ask Roy Barnes. This is a great chance to model to our students on how to affect a positive change. Don’t just call your State Rep, but write him. Speak to you Professional Organizations. I can tell you my PAGE rep is about to get an earful. Get other state employees involved. This insurance affects them as well. We don’t have to put up with so why should we? Let’s stay very positive and professional and do something about this. Together, people. we got our backs. Very well written. I, too, remember Ol' Roy, how he didn't listen to, nor wanted input from, teachers in this state. I was in the beginnings of my teaching career, very wet behind the ears. Now, years later, I've been out of the classroom for a few years, and I'm not sure I want to step back into the classroom full time. I'm seriously considering finding employment in the private sector. Not because I don't enjoy teaching, I just don't want to deal with the crap. Thank you for putting into words what many think.